Deb's Cup of Tea: Sights along the way. I think one of the reasons I enjoy driving on a trip, when it's practical, is that you can see some interesting things which would be completely missed from the air. Take this item. You see these along some sections of the Indiana Toll Road. They are solar powered and consist of what look like canisters attached to a box. They don't glow, nor do they seem to be part of a sign system. What in the world are they? Well, I remember when they were installed. They are deer deterrents. They are located in areas where there are woods adjacent to or within 500 feet of the interstate. The canisters emit a radio signal between each post. 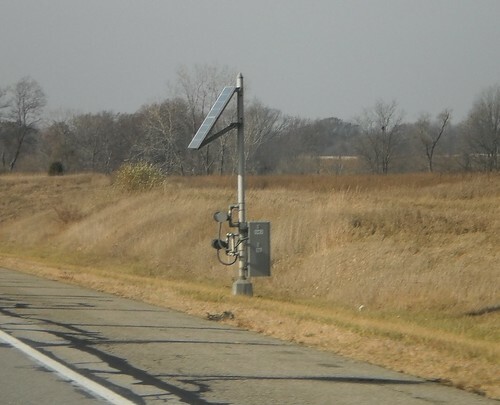 Not only does this annoy the deer, but, if a deer crosses between the signal, that is the box's cue to send an alert to a central location. Police or road crews can be dispatched to check the area. It seems to be effective. Traffic hitting deer has been reduced by almost 40%. The state has provided locations where deer don't have to deal with these machines and that has traditional deer crossing signs, but it's obvious there's deer and you can see them clearly in these areas. Pennsylvania would do well to look into some kind of deterrent. I quit counting the number of deer carcasses I saw along the roadside. The amount of damage a fully grown deer inflicts upon a car when the two of them collide can be enough to total a car. Plus, people can be injured or killed when 800 pounds of animal come over the front and into the windshield. If something like this works reasonably well in Indiana with broad fields on either side of the road, you'd think other states would adopt it. Maybe a New Phone is in Order. Yes. This Makes Me a Nerd. Yes, it is my birthday. So you don't have to. Do I HAVE to clean here? There are some things one simply MUST have. Happy birthday a month early. It was not a cat-less vacation. I think this is awesome. So this is what she does when I'm gone. I just wanted to go home. Coming to a vacant lot near you.